Bringing back the essence of the 90’s club scene and the powerful vibe created through dance, orchestrated by the djs. On this night, our artists will be performing vinyl sets during the night! 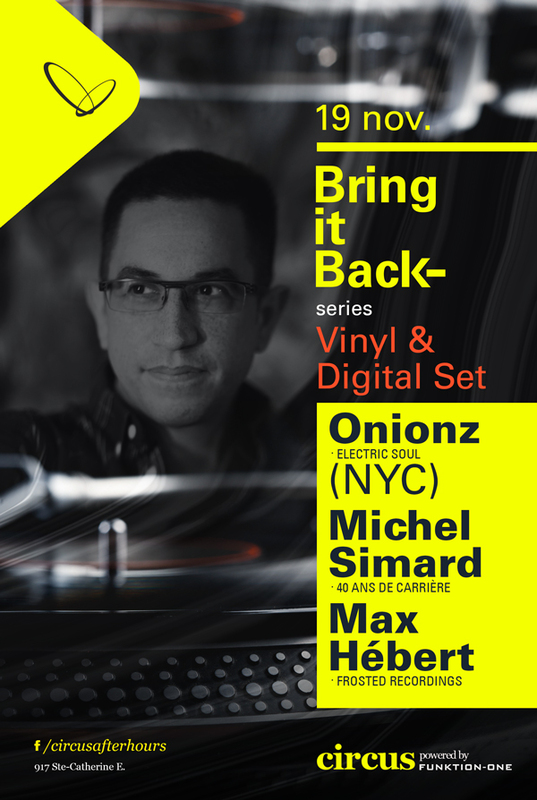 A native New Yorker, Onionz has been moving dancefloors worldwide for over 30 years with his signature style since the early days of House music. He has headlined events in over 40 states as well as in Canada, Asia, Europe, Central and South America with attendances of up to 15,000 revelers in famous venues such as Ministry Of Sound, The Roxy, and Pacha NY/Ibiza. Not just a DJ, Onionz is also a well-known and industry respected producer with an originalcatalog of over 150+ tracks and remixes that can be heard regularly performed by top notable Djs. inception. Onionz has recently been asked to participate as the Musical Director for the full feature film Xing. 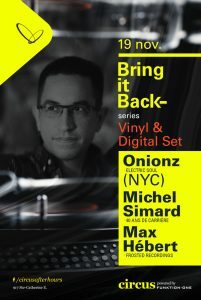 We also celebrate the Michel Simard’s 40th anniversary of djing! And we are proud to present Max Hebert, owner of Frosted Recordings, and dj since over 20 years. *** 3 pionneers of the industry in one unforgettable night!